After a 7 years restoration, the gradual reopening of the Castle to the public has begun on 4th April 2014. 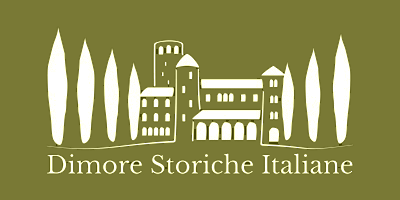 For information about the activities, write to info@castelloroccasinibalda.it. Individual visits: only possible as part of a group, with a minimum of 10 paying participants per group and a maximum of 20. Organized group visits: always possible, except for someholidays ( 25th, 26th and 31st December, 1st January, Easter ) and some special events. Please check on the site. Photography&filming (for non commercial purposes): allowed only in open spaces. Areas open to the public are underlined. The majestic entrance leads towards the ramparts and the Court, a large crenelated space which can be reached through a narrow tunnel, easy to defend. The walkways encompass the entire perimeter of the castle and affirm its military identity. This is where the lookout towers and the artillery pieces were located. The 360°view of the Turano Valley and of the elegant and well-preserved village of Rocca Sinibalda encompasses a pristine territory, with forests and mountains intersected with pastures along the river. The Piano Nobile (Lord’s Floor) of the palace can be reached by a wide staircase leading up from the Court into the Grand Hall, with the 18th century frescoes and the Three Fates by Marcos Cei.The long Gallery which leads to the terrace at the northern “tail” or end of the Castle is one of the most impressive architectural features of the building. The halls in the Gallery: the Library, the Shaman’s Room, the Room of the Criminal, the Hall of the Enchanted Garden, the Music Room, and the Hall of the White Totem. 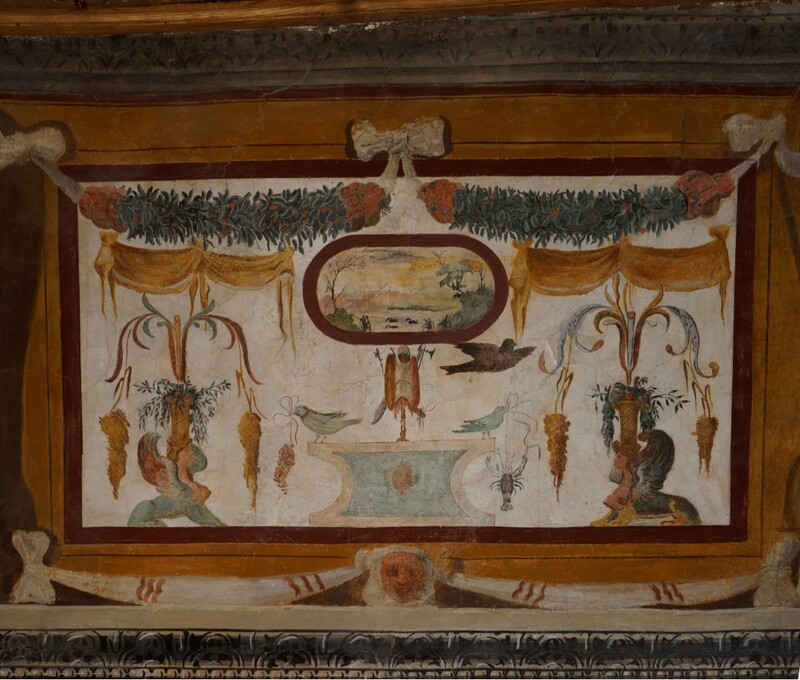 Each of the halls houses unique objects and collections matching its identity.The upper sections of the walls are decorated with Renaissance and Mannerist paintings – the frescoes inspired by Ovid’s Metamorphoses, and the Grotesques. The walk through the Gallery engulfs the visitor in a narrative of transformations. The Cellars are an 80m long area of unexpected elegance. They end into a small Theatre adjacent to the underground cistern located under the Courtyard: large enough to allow exploration with a floating boat, it was used to collect and store rain water for the summer and during the sieges. The Subterraneans run between the walls of the Castle and the rock.There are approximately 6 levels, home to a colony of large bats. Yes, 4 levels can be visited, but it’s not for the faint of heart. The Collections include ritual masks of the Pacific Northwest Indians, Indian totems (one 9 meters in size), African masks and tribal objects, the Padiglione mask collection, sculptures by Agapito Miniucchi, and “street art”. The Hanging Gardens, from which you can see the forward spur of the castle, with its two lateral bastions: an eagle’s beak with outstretched wings, according to some; more reliably, the head of a scorpion. The Castle is not only a place to discover and admire the artistic and architectural achievements of the past. It is what important castles have always been: a crossroads for the future, a place where destinies, knowledge, goals, and ambitious projects can meet to open new and unforecast perspectives. The Castle is a place where you can imagine and plan «invisible cities»(I. Calvino). The Castle will host exhibitions, scholarly workshops, workshops for corporate management teams, art workshops, artists in residence, private events, meetings and debates about its social context, theatre and music. The Castle plans to become the heart of a network for the cultural and technological “new renaissance” of its territory. Metamorphosis is the ambitious goal and key word for all the events, the activities, and the projects related to the Castle. Nobody should leave it without feeling somehow different. Companies and institutions The Castle is the perfect venue for corporate events focusing on fertile confrontation, strategic thinking, creativity, or innovative communication. Beautiful and intriguing forms nurture new thoughts and liberate group energy. The Castle can be booked for events lasting one to several days, it can be set up to match diversified group needs and itineraries. All of the most advanced technological tools are ready to hand. Families Special optional activities can be plannedfor families visiting the Castle. Two major themes are history, including daily life and art in a Renaissance castle;and mythology, the stories and the masks of the Indian tribes of the North American West. Those themes will be presented throughaudiovisual labs, theatre performances led by professionals, arts and crafts activities of sorts. Both adults and children will be engaged! Schools A visit to the Castle is a unique learning opportunity for children. There will be age-specific activities. An ad hoc program built around a few agreed themes can be assembled for each visit. Some examples: what is a castle; the history of Italy as seen through the history of this castle; what does Renaissance mean; the mythology and life of the Indians of North America; the power of “primitive art” and its ability to unleash the creativity of a child at different school stages. The tools? No holds barred: theatre and the audiovisual, apps, hand-made papier mâché, nature minitrails, collages, plaster, ceramic and leather masks… For the accompanying instructors, a number of teaching aids will be available before hand to help them prepare the visit and the activities. Optional materials will be available for in-depth follow ups after the actual activity or lab. Artists The large and unusual spaces, the tall ceilings, the cisterns, the cellars, the subterraneans: all perfect locations for art and music experimentation. The Castle is open to young creative, for experimenting, for group work and for quality projects. Short or long-term exhibitions can be booked, as well as stays in residence. The village of Rocca Sinibalda Shaped by the history of the castle and its dominant position on a rock dominating the Turano Valley, Rocca Sinibalda is one of the most beautiful villages east of Rome. A walk along Via degli Archi and Via del Sole allows the visitor to grasp the full majesty of the castle, with its forward spur, its hanging gardens, its ramparts and its palatial structure. From Via degli Archi a side street leads to the square on which rests the awesome power of the “tail” of the building, perhaps Peruzzi’s most daring architectural invention. Artillery and rifle crossfire from its upper section could easily stop any attacks and control the valley. Via degli Archi provides an easy access to several viewpoints points on the outer ramparts of the fortified village, the first line of defence of the castle. The comfortable and peaceful setting invites the casual visitor to admire the valley as it continues along the forgotten ‘old’ Via Salaria towards Rieti, with nearly no traffic. Piazza della Vittoria, the Town Hall’s location, is also the entrance to the Agapito Miniucchi Museum. Miniucchi is a ninety-year-old medical doctor, born in Rocca Sinibalda in 1923. He has created a series of works in iron, wood and stone of astonishing strength and modernity, currently on display in Spoleto, Todi, Terni, and Rocca. The city council has allocated some space for a permanent exhibition of his work, mostly late period pieces: a must see. One of his stone works stands in the public park of the newly-renovated square (a hotly debated renovation). 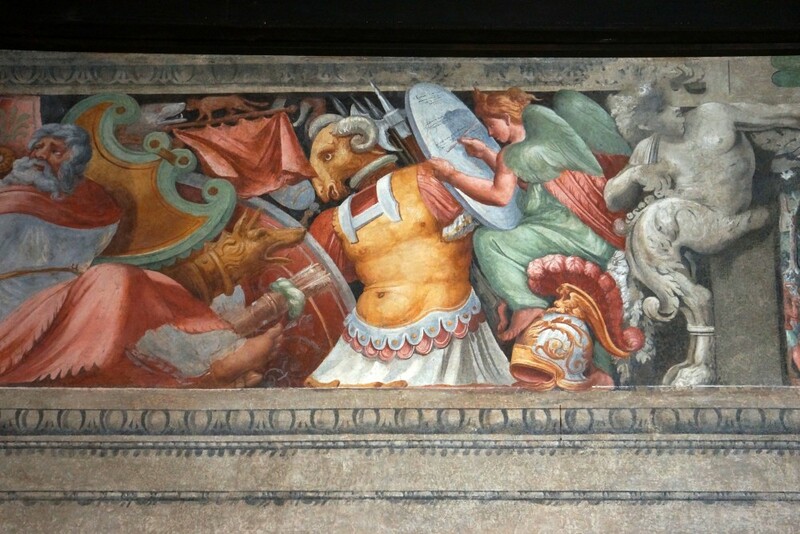 Some other sculptures by Miniucchi are to be found in the Castle’s collections. A short stroll down Via del Molino reaches the Turano River, which lost much of its surge after the construction of the dam that created the Lake Turano. A short walk along the lower valley leads to the remains of a large water mill. Its grinding stones have been preserved in the gardens of the Castle. The small villages around Rocca sinibalda are hamlets with evocative names like Vallecupola or Magnalardo. They are well preserved examples of a rural society still making a living out of sheep and forestry. The largest one is Posticciola, with its fortified palace and a museum of rural civilization waiting to be refurbished. A few kilometres towards Longone, and there comes the area of Lake Turano, with its stunning views of the dam and the basin of the lake.It features several readily-accessible picnic areas, boating facilities and fishing piers, but is still in want of serious development. The team of the Lazio Rowing Federation sometimes trains there. 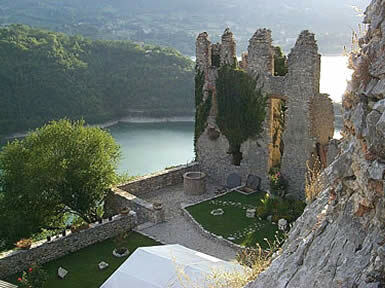 Castel di Tora, a castle perched on the northeastern shore of the lake, is impressive and elegant. Not to be missed is the ghost village of Antuni, partially destroyed by the bombingsof 1944; it offers some magnificent views of Lake Turano. Rebuilt and restored after the war, the hamlet is now falling back in a state of disrepair still unable to obliterate its beauty. A 2 hours walk from Rocca Sinibalda leads to the summit of Monte Pelato. At 950 meters, it offers unrivaled views of the village and its castle. Only from Monte Pelato one can fully appreciate the harmonious relationship between the settlement, the castle, and the rocky outcrop onto which the buildings and the ramparts stand. For the lazy ones, a short drive to the hamlet of Trampani takes you to the starting point of a mostly flat trail to the summit. 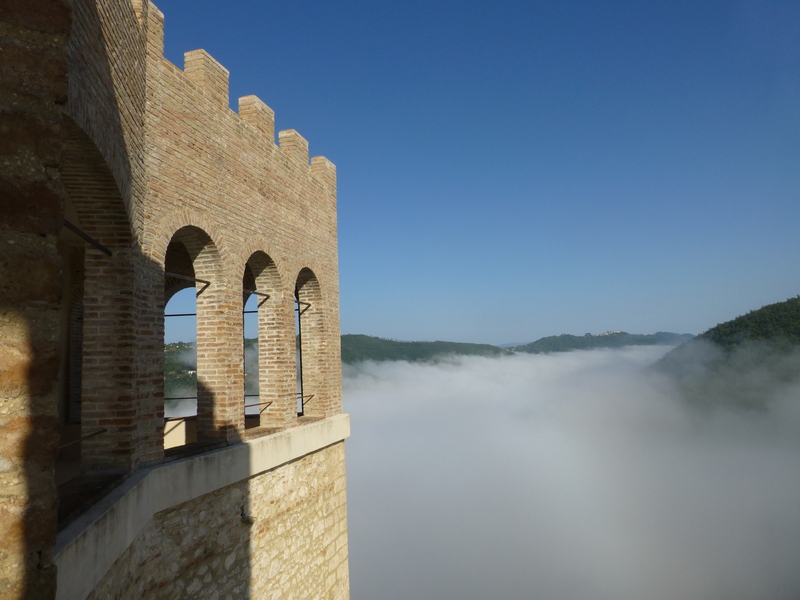 New marked trails from Rocca Sinibalda will soon be operational. An interesting but more challenging hike leads from the village of Vallecupola to the summit of Mount Navegna (1508 m), in the heart of the Reserve of Navegna and Cervia. It takes a 3.5 hours walk on an old transhumance trail, through a landscape of never ending forests, lakes and sizable gorges. Due to the variety of its landscapes, the park is well worth repeated explorations. Visitors will enjoy the lovely views of the lakes and the valleys of Salto and Turano, with their significant traces of a traditional farming way of life. Some historicalMedieval and Renaissance performances are held in that area, reviving historical events. Many well-marked trails cross the Reserve, which includes beech, chestnut, and oak. In the spring the forest undergrowth is covered with the intense blooms of orchids, violets, anemones and cyclamen.